We are giving away free tickets to Billy Hayes’ show at the Comedy Festival tomorrow and Thursday night, courtesy of Billy himself, who talks about his lifelong relationship with yoga in his show. 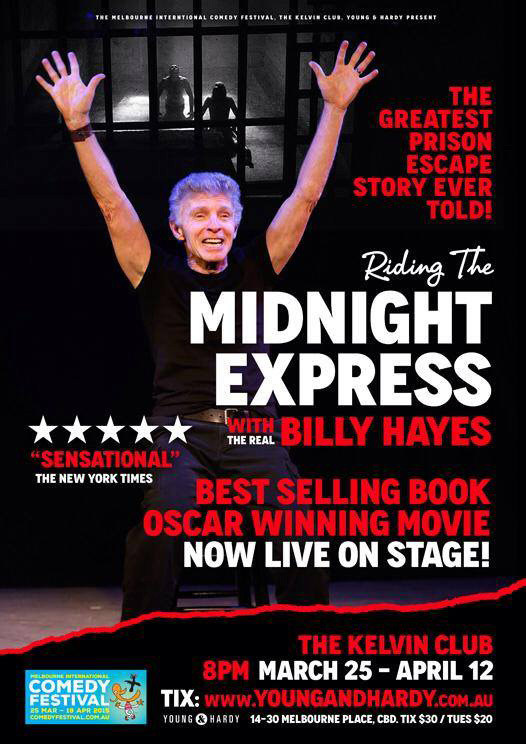 Writer of the book ‘Midnight Express’, Billy Hayes recounts the true story of his time in Turkish prisons and his brazen, harrowing escape, at this year’s International Comedy Festival in Melbourne. Billy’s story involves turning to yoga to help him through dark days spent in a Turkish prison. His subsequent best-selling book, titled ‘Midnight Express’ became an Oscar winning film and now he’s touring the world telling the true tale himself, in person. Given his relationship with yoga over the years, Billy has kindly gifted us ten double passes to his show to give away. To enter, ‘Like’ and ‘Share’ this post on our Facebook page. Please ensure you have your ‘Share’ setting on ‘public’ so we can see your share and enter you into the draw. Be in quick – the shows are on tomorrow night and Friday night in Melbourne, starting at 7:45pm. Winners will be contacted by us via Facebook with details of how to claim their tickets. This offer is in no way affiliated or endorsed by Facebook.